Penrith is a historic market town in the Eden Valley, just outside the border of the Lake District National Park and only 6 miles from Ullswater and Pooley Bridge. It was once the capital of Cumbria but now serves as important regional shopping centre. The other major towns in the Eden Valley are Kirkby Stephen and Appleby. Hotel accommodation in Penrith town centre includes the George Hotel and the North Lakes Hotel. The 3-star George Hotel enjoys a central location on Devonshire Street and is the town’s oldest hotel. The 4-star North Lakes Hotel is a little further out, close to the M6 motorway, but offers a swimming pool and other leisure facilities. Penrith Castle was built in the 14th century but 200 years later was in ruins. Brougham Castle is more complete and lies just south east of the town centre. Both castles are managed by English Heritage. Beacon Hill overlooks the town and fires have been lit here since Roman times to warn of impending attack. The current Penrith Beacon was built in 1719 and is a popular tourist attraction offering great views of the town. Robinson’s School was built in 1670 but now houses the Penrith and Eden Museum and the Penrith Tourist Information Centre. St Andrew’s Church stands in the town centre at the junction of King Street and Middlegate. The main body was built in the early 18th century but the tower was constructed 500 years earlier. In the churchyard is a collection of 10th century crosses and hogback stones known as the Giant’s Grave and a cross from the same period called the Giant’s Thumb. Rheged, just west of the town centre, is Penrith’s most popular tourist attraction. It boasts a giant screen cinema showing mainly 3D movies and a good selection of specialist shops. Mainstream films are shown at the Lonsdale Cinema (formerly the Alhambra), a 2-screen cinema on Middlegate. Ullswater is 9 miles in length and is regarded by many as the most beautiful lake in the Lake District. The picturesque village of Pooley Bridge lies at its northern end, and is just a short drive from Penrith. Ullswater offers a range of water-based activities such as cruises on the Ullswater Steamers. Many walks start in the Ullswater Valley including the famous route to Helvellyn via Striding Edge. A more leisurely walk takes in the beautiful Aira Force. One of the best ways to arrive in Penrith is by taking a train on the Settle to Carlisle Railway. The line doesn’t pass directly through the town but stops at Langwathby, just 5 miles away by road. Other attractions around Penrith include Little Salkeld Watermill, Acorn Bank Garden and Watermill at Temple Sowerby, Dalemain House & Gardens near Pooley Bridge, Hutton-in-the-Forest, Lowther Castle & Gardens and the Lakeland Bird of Prey Centre, and the South Tynedale Railway. Penrith Leisure Centre on Southend Road boasts a 25m swimming pool, a learner pool, fitness centre, an indoor bowling green, climbing wall, and sports hall. Other sporting facilities in the area include the Penrith Skate Park (next to Penrith Leisure Centre), Penrith Golf Centre & Driving Range, and Penrith Golf Club. Events in the area include the Penrith May Day Gala, held on the first Monday in May, the Kendal Calling music festival, and the Appleby Horse Fair. Henry III granted Penrith its market charter in 1223 and centuries later the town is still the most important shopping centre in Eden. The centre has a good mix of shops, most of which are found on King Street, Middlegate, Devonshire Street and the Devonshire Arcade, Little Dockray, and Angel Lane. Cranstons are award-winning purveyors of fine foods and meats. They have a shop on King Street and a food hall on Ullswater Road. The Toffee Shop on Brunswick Road sells handmade fudge and toffee. It was established in 1910 and can count Prince Charles amongst its loyal customers. Other shops in and around the town centre include the Fish Cellar (fishmongers) in Devonshire Arcade, the Gem Den on King Street, and John Norris (fishing tackle and outdoor clothing) on Victoria Road. A leaflet offering a more comprehensive list of independent shops in the town centre is available from the Penrith Tourist Information Centre. Traditional street markets are still held in the town every Tuesday on Great Dockray, complemented by a farmers market on the third Tuesday in every month on Market Square. The town centre is currently being extended to the south by the Penrith New Squares development. It will be home to a Sainsbury’s supermarket, shops, restaurants, and housing. Completion is scheduled for 2012. The villages and countryside surrounding Penrith are home to a plethora of art galleries and specialist food stores. The greatest choice is found at Rheged, just a few miles west of the town. Others include the dairy shop at Abbot Lodge, the farm shop at Bessy Bank Trout Fishery, Beckstones Art Gallery, the Red Barn Gallery at Melkinthorpe, and the Upfront Gallery. Penrith is just off Junction 40 of the M6 motorway. Both A6 and the A66 pass through the town centre. The A66 offers direct connections to Keswick and Appleby, while the A66 links it to Kendal and Carlisle. There are three pay-and-display car parks in the town centre (Sandgate, Bluebell Lane and Princes Street). A map and details of charges is available on the Eden District Council website. Free street parking is also possible in Penrith, provided a parking disc is displayed. They can be obtained from many shops in the town centre (look for a parking poster in the window) and the Penrith Tourist Information Centre. The Tebay Services, near Junction 38 of the M6 motorway, is the only family-owned motorway service station in England. It boasts a farm shop, butcher’s counter and an excellent café that makes good use of local produce. The Westmorland Hotel is also here. Penrith train station is located to the south west of the town centre (address and postcode: Ullswater Road, Penrith CA11 7JQ). The station is on the West Coast Mainline. Virgin operates fast trains from Scotland to London and Birmingham that call at Penrith. First TransPennine Express operates a service from Edinburgh/Glasgow to Manchester Airport that calls at Carlisle, Penrith, Oxenholme, Lancaster, Preston, Bolton, and Manchester Piccadilly. The train from London to Penrith takes around 3 hours. The journey time from Carlisle to Penrith is just 15 minutes. To view timetables and get ticket prices to and from Penrith go to the National Rail Enquiries website. The closest airports to Penrith are Newcastle (76 miles by road), Blackpool (81 miles), Manchester (109 miles), Leeds Bradford (92 miles) and Liverpool (113 miles). 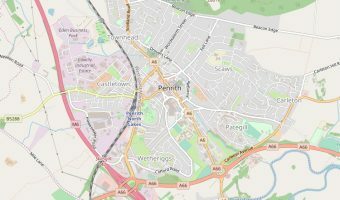 Map of Penrith and surrounding area. Shows hotels and tourist attractions.